One of the most mysterious underwater cities is the Ker-Is, which sank off the coast of Brittany (northwest of France) in the Gulf of Douarnene supposedly in the first half of the 5th century. He founded it and made the capital of his kingdom the legendary Gradlon the Great, who ruled Celtic Armorica (modern Brittany). According to the legends Ker-Is was built on land belonging to mighty fairies, but they were supportive of Gradlon and generously yielded to him part of their possessions. The city grew up literally before our eyes, and soon equal to its beauty and wealth was not in the Celtic lands. 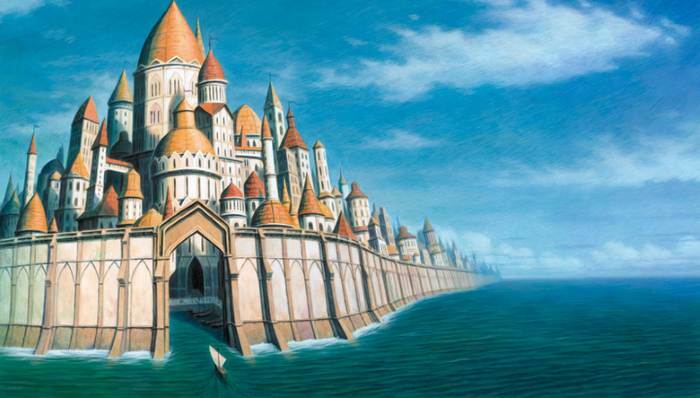 From the sea, approaching directly to the walls of Ker-Isa, the brainchild of Gradlon was protected by a huge dam, and the golden key from her locks, which also opened the city gates, the king always wore around his neck. I must say that Gradlon the Great was one of the first Celtic kings to accept Christianity. He was baptized by the wise Saint Gweniol, who later became a good friend and assistant to the ruler. On his advice Gradlon erected Ker-Is as a Christian city, decorating its streets with cathedrals and chapels. However, for a short time the king ruled a new city. Soon he transferred power over Ker-Is to his only daughter, Dakhut, who had long begged for this generous gift from her father. Unlike a kind and generous parent, the princess possessed an evil and ruthless heart, which according to legend, the girl received a “gift” from one elven sorceress, offended Gradlon many years ago. Having chosen Dahut as a weapon of vengeance, the elf cast a spell on the princess: she will not rest until the king himself, his family and his city are destroyed. Having obtained unlimited power over Ker-Is, Dahut immediately began to introduce her own order in the city, encouraging deception, idleness and debauchery. She herself indulged in debauchery, changing lovers almost every night. When the lover bored the governess, some black people standing in her service choked the unlucky young man and threw his body into the deep sea during stormy nights. But one day the princess fell in love with a man from foreign lands and decided to secretly spend her chosen one in the city. For this, one of the nights Dakhut stole her father’s treasured golden key, but in the dark confused the doors and instead of the city gate opened the locks of the dam. Huge waves swept the city, sweeping everything in its path, but Gradlon, awakened by the holy Gweniol, managed to jump on his horse and gallop away from the dying Ker-Isa. But a good ruler could not ruin his beloved daughter, and then the saint himself pushed her into the abyss. Only the waters closed over the head of the princess killer, as the sea immediately calmed down and the king was saved. Following the Christian precepts, Saint Gweniol wanted to immediately commemorate the mass after the souls of the dead residents of Ker-Isa, but the insidious Dahut, transformed by evil forces after death into a mermaid, prevented him, breaking the chalice with holy gifts. Since then, it still rules as a beautiful hail, though already standing at the bottom of the sea, and its inhabitants who have not found peace. Of course, the events of those days could be called just an old legend, if their heroes – Gradlon the Great and Saint Gweniol – were not real historical figures. Also, the legend says that after the death of Ker-Isa, the rescued king founded a new capital – Kemper, and this city exists in our days. And one of its main attractions is the equestrian statue of Gradlon, established at the end of the 12th century between the spiers of the cathedral. The existence of a once significant metropolis on the coast of the Gulf of Douarnene is also spoken by the remains of Roman roads, which are falling off the sea. In addition, the inhabitants of Brittany believe that Ker-Is went under the water not completely and the waves spared his small “piece”. This is today considered to be the island of Tristan in the Gulf of Douarnene, not far from the city of the same name. I must say that this part of the land was not given its name by chance, since at one time the island became the place where the plot of another famous medieval legend unfolded. They say that it was here that the legendary knight Tristan was hiding from royal wrath, after which “a piece of Ker-Isa” was named after him. Interestingly, at about the time when supposedly Ker-Is went underwater, another megalopolis of France of the early Middle Ages, Lutetia, was renamed Paris (Paris), since this name is translated from Breton like Isa. It is also known that when the future capital of France received its new name, an old druid predicted that Is will rise from the waters when Paris goes under the water. And if in those days, few people believed this prophecy, today, in connection with the threat of global warming, climate change and the rise in the level of the World Ocean, the words of the druid should be considered. Whatever it was, the Bretons are sure that under the thickness of the water life in Ker-Issa continues. And this is despite the fact that over the past decades numerous diving lovers have repeatedly explored the bottom of the Gulf of Duarnten along and across, but the remains of the ancient city were not found there. However, from time to time here from the water ringing bells, and to establish the source of these sounds is not possible. Esotericists believe that Ker-Is fell into a parallel dimension, since the “land of fairies” on which Gradlon built the city, has always been considered a place of sanctuary full of various wonders from time immemorial. However, according to another version of the researchers of paranormal phenomena in the underwater imprisonment of Ker-Isa, the curse imposed by the elven sorceress on Dahut is to blame. That can not rest in peace and will not let the souls of the subjects, while there is one descendant of Gradlon on earth. In the opinion of the people of the believers, a memorial mass could have been resolved to solve the problems of the city-martyr, which St. Gvenolele did not serve. Whatever it was, but the inhabitants of Ker-Isa do not lose hope for salvation. Residents of Duarnene and surrounding settlements say that the underwater city has repeatedly “sent” messengers to people, so that by simple word or deed made it easier for the underwater city. So, one day two Breton ladies, going to sunbathe in the distant quiet corner of the city beach, were surprised to see there a shop with goods, where merchants traded in strange clothes. For their incomprehensible, even, you might say, exotic goods, they asked for a ridiculous price, but the ladies did not have any money with them. Convinced of this, one of the traders with desperation exclaimed that if he had received from a man at least a su, Ker-Is would have been saved. After that, the shop, and merchants, and goods literally dissolved in the air. Another similar story, which occurred a few years ago, is more perplexing than pity for the city that was lost. Somehow in the twilight, to the two teenagers who were cleaning up the garbage on the deserted beach, a handsome old woman came up and asked her to help her bring a bundle of brushwood to the house. Young people were surprised – what for it could need firewood to the modern pensioner of the European Union. Considering this some kind of eccentricity, they explained that they can not quit an urgent job and politely refused an elderly lady. The same in response, she began to shower the boys with filthy curses and curses, shouting at the same time that, if they said yes, the beautiful city would be freed from perpetual torment. Not expecting such words from the dear old woman, the teenagers hurried to retire, discussing among themselves whether it is worth saving a city where elderly ladies perfectly master a three-story dialect.